In June 2011, two organizations from Mendocino County joined forces to present a fantastic event that should be the model for any wine region trying to promote tourism in their area. 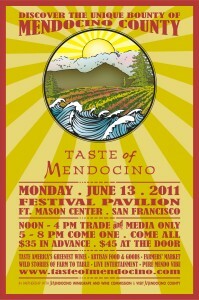 The Mendocino WInegrape and Wine Commission and Visit Mendocino County presented “Taste of Mendocino”, and they have already scheduled to repeat it in June 2012. Wineries – Over 60 wineries came to pour their wines, with our favorites being Baxter Winery, Drew Wines, Handley Cellars, Lazy Creek Vineyards, McNab Ridge Winery, Meyer Family Cellars, Navarro Vineyards, and Roederer Estate. In addition, the CORO Mendocino collaboration also had their 2008 releases available for tasting. If you found something you liked, you could buy wine at the event as well. Breweries – In addition to wineries, local breweries were also present including Mendocino Brewing Company, North Coast Brewing Company, and Ukiah Brewing Company. Restaurants – Food samples were provided by Cliff House Restaurant, Mendo Bistro, and Piaci Pub & Pizzeria and several other producers. Lodging – Representatives from Mendocino County’s hotels, inns, and rental properties were showing pictures and slideshows of their facilities. This was a great way to preview options such as Breakers Inn, Little River Inn, and the Mendocino Hotel. Attractions – There were also tables promoting (and offering discounts on) attractions such as Kayak Mendocino, Mendocino Coast Botanical Gardens, and the Skunk Train. 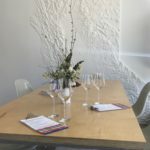 Local Events – Representatives from popular Mendocino County events including Crab & Wine Days, Little River Whale Festival, Mendocino Music Festival, Wine and Mushroom Festival, and WineSong explained the programs to try and drum up future attendance. Artisan Products – Impressive jams from Black Dog Farm, chocolates from Cocoa Bungalow, jams from Pacific Preserves, and soaps from Potter Valley Soap Works were on display and available for sale, among others. In addition to the vendors present, there were also multiple flyers, handouts, and booklets promoting other businesses and local communities in Mendocino County. In just a few hours, a Taste of Mendocino attendee had everything he or she would need to plan a future trip. Or three.